Including the best ICS Baluns, PairSavers (Ethernet using POTS), and ETS's Monoline product family. The unique ETS Monoline™ Baluns, only from ETS, allow you to reuse existing premise cabling for Ethernet 10-BaseT networks. One run of coax replaces two pair UTP with improved NEXT (near-end crosstalk) over the 802.3 specification. A Monoline Balun™ at each hub port and one at the workstation completes the installation without the expense of rewiring your facility with UTP for data. Coax has better high-frequency characteristics than UTP, allowing run lengths of up to 200 meters (650ft). Many configurations are available to meet your connectivity requirements. Many standard applications will utilize a female BNC and an RJ45 plug. 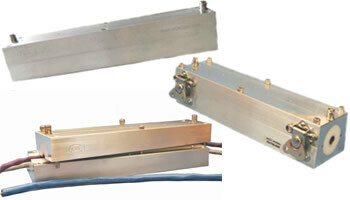 The unique ETS Monoline™ F Series Baluns, only from ETS, is a welcome addition to our existing Monoline™ Product Line. These products extend our capabilities to provide you with solid 10 BaseT Ethernet connectivity or F-connector terminated RG59 or RG6 (75Ohm) coaxial cable. The Monoline™ F45 and FP-45 are designed to connect directly to your cable or wall F termination, permitting a UTP patch cord connection to your NIC, switch or hub. The Monoline™ F-C5P model is used to terminate to a loose F-terminated cable and punch down to a keystone jack that can be plate mounted in the wall for a more rugged and visually appealing installation. NOTE: You cannot simultaneously run CATV and 10 BaseT signals through the cable and you cannot split the cable. All runs must be direct, point-to-point connections. Using the Monoline™ technology available ONLY from ETS, you can use pairs of pre-installed telephone wire already in place to set up a 10BaseT network - all without rewiring! At the wiring/distribution closet, place Monoline™ Panels, and your 10BaseT hub equipment. Terminate the unused telephone pairs onto standard punchdown blocks on the back of the Monoline™ Panel. Patch your hub into the Monoline™ Panel using standard data patch cables. 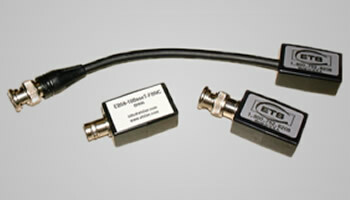 (Available with F-connector for use with pre-existing coax runs). At each endpoint (room or suite), replace the existing phone jack with either our Monoline™ Dual Outlet, or add a Monoline™ Keystone Jack to an existing installation with either a wallmount box or a new wall plate. Phone service continues, and on the single remaining pair of twisted pair wiring, you now have a complete 10BaseT connection. 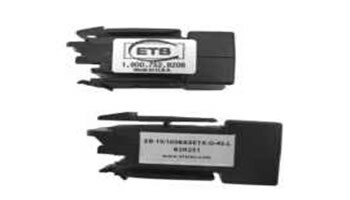 These unique Monoline™ Baluns, only from ETS, enable you to re-use existing premise cabling for Ethernet™ 10BaseT networks. One single pair of UTP or STP replaces two pair UTP yet with improved NEXT (near-end crosstalk) over the 802.3 specification. A Monoline™ Balun at each hub port and one at each workstation completes the installation without the expense of re-wiring a facility with UTP for data. Standard 802.3 distances (100 meters) are supported over a single pair of UTP or STP. The ETS Pair Savers used as shown enable the support of two 10BaseT connections with a single UTP network run... simply, easily and economically. 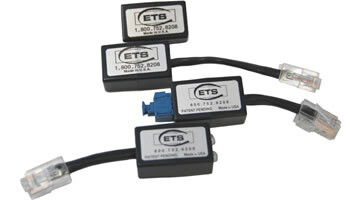 The ETS Data Piggyback technology, only from ETS, permits transmission of 10BaseT (Ethernet) signals across already installed ordinary telephone wiring, while voice connectivity continues uninterrupted. Using frequency combination and separation techniques, two pairs of wire can carry full data connection (transmit and receive pairs), as well as two phone connections. 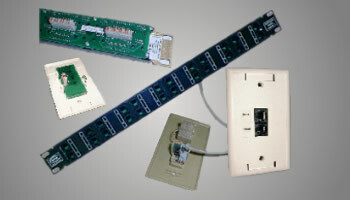 ETS Data Piggyback is typically configured with a 20 port wall mount panel installed in a wiring closet or other place adjacent to voice and data equipment. At each run?s endpoint the lines may be terminated in either a wall plate unit or a convenient desktop box with voice and data connections. NOTE: Residential systems and most hospitality and other commercial installations operate flawlessly with this equipment. However, the ETS Data Piggyback units are not compatible with most PBX systems using high-frequency signaling for control functions. Monoline™ Piggyback technology, available only from ETS, enables transmission of 10BaseT (Ethernet) signals across already-installed ordinary telephone wiring, while voice connectivity continues uninterrupted. Using frequency combination and separation techniques, a single pair of wires can carry a single data connection (transmit and receive pairs), as well as a phone connection. The Monoline Piggyback is typically configured with a twenty-port wall mount panel in a wiring closet or other area adjacent to voice and data equipment. At each run?s endpoint, lines may be terminated in either a wall plate unit or a small desktop box with voice and data connections. Note: Residential systems and many hospitality and other commercial installations operate flawlessly with this equipment. However, ETS Monoline™ Piggyback units are not compatible with most PBX systems that use high-frequency signaling for control functions. 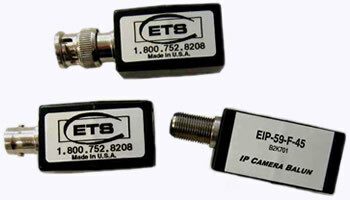 The ETS ICS Cable Adapters for 10/100BaseTX, and 10/100BaseTX with Ultra Low NEXT (with or without impedance matching [IM] feature a RJ45 jack (pins 1, 2, 3, and 6) at one end and 4 position Universal Data Connector (UDC) at the other end. Mate 150Ohm IBM Type 1 (STP) to 100Ohm UTP for running 10BaseT 100BaseTX. You can now install an 802.3 Ethernet network without the expense of rewiring to UTP. The Low NEXT 10/100BaseTX Adapter is applicable in situation where the user wants to minimize data error rates at the maximum rated distances, offsetting the possibility of marginal cable or installation quality. 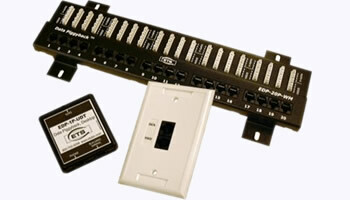 EA-DATA-U products are cost-effective, non-impedance matching adapters that function well in many installations. Longer distances and the lowest data error rates require Low NEXT adapters. 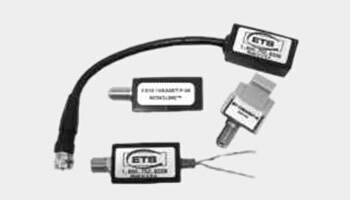 The Energy Transformation Systems, Inc. Cable Clamp (CC-101/CC-102/CC-109) are used in the common-mode test of the IEEE Standard 40.6.1.3.3, which is used to determine the sensitivity of the 1000BASE-T or 10GBASE-T receiver to common-noise from the link segment. This specification is provided to limit the sensitivity of the PMA receiver to common-mode noise from the cabling system. Common-mode noise generally results when the cabling system is subjected to electromagnetic fields. The Cable Clamps inject common-mode signals into a cabling system. The Cable Clamps have a copper center conductor surrounded with high density polyethylene dielectric and an aluminum outer case which acts as a conductor. The CC-102/109 allows testing of CAT6A and CAT7 cables. The CC-109 has 4 spring latches for quick and easy test set ups. Use of 6 bolts is optional. All units can test 1 - 10 Gigabits.